Home » Directories » Buyer's Guide » Linear Technology Corp. Linear Technology Corp. introduces the LTC7813, a dual output (boost + buck), low quiescent current synchronous DC/DC controller. When cascaded, its independent step-up (boost) and step-down (buck) controllers regulate the output voltage from an input voltage that can be above, below, or equal to the output voltage, including during an automotive load dump or cold crank. Linear Technology Corp. introduces the LTC4125, a wireless power transmitter, complementing our wireless receiver ICs for the wireless charging market. The LTC4125 is a simple, high performance monolithic full bridge resonant driver, capable of delivering up to 5W of power wirelessly to a companion receiver. It functions as the transmit circuit component in a complete wireless power transfer system comprised of transmit circuitry, transmit coil, receive coil and receive circuitry. Linear Technology’s SmartMesh IP™ wireless sensor networking products now provide the ability to program industrial Internet of Things (IoT) applications directly on the embedded ARM Cortex-M3, running Micrium’s µC/OS-II real-time operating system. Linear Technology Corp. announces the H- and MP-grade versions of the LT8705. A new low power I/Q modulator from Linear Technology enables battery-powered transmitters operating in the 30MHz to 1.3GHz frequency bands, breaking new ground in power consumption, sideband suppression, carrier leakage and dynamic range performance. The LTC5599 modulator, powered from a single 2.7V to 3.6V supply, draws only 28mA current, less than 60% that of alternative solutions-with no performance sacrifice. A new low power I/Q modulator from Linear Technology enables battery-powered transmitters operating in the 30MHz to 1.3GHz frequency bands, breaking new ground in power consumption, sideband suppression, carrier leakage and dynamic range performance. 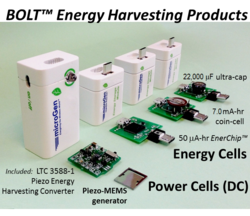 Linear Technology announces the LTC3331, a complete energy harvesting solution that delivers up to 50 mA of continuous output current to extend battery life when harvestable energy is available. Linear Technology Corp. introduces the LTC6948, a high performance fractional-N PLL with 6GHz-plus integrated VCO. Linear Technology Corp. announces the automotive (H-grade) and high reliability military (MP-grade) versions of the LT4320, an ideal diode bridge controller for 9 to 72 V systems. The LT4320 replaces a full-wave diode bridge rectifier with a low loss N-channel MOSFET bridge to reduce the power and voltage losses by a factor of ten or more. Power supply size is reduced as the enhanced power efficiency eliminates bulky heat sinks. Linear Technology Corp. introduces the LTC2323-16, a dual 16-bit 5 Msps simultaneous sampling, successive approximation register (SAR) ADC with flexible differential inputs. The LTC2323-16 supports a wide input common mode range and simplifies system-level design by relaxing the signal conditioning requirements to drive the ADC with a wide range of analog signals up to Nyquist frequencies. Linear Technology Corp. announces the LT8710, its first synchronous SEPIC, inverting, boost and flyback multi-topology DC/DC controller. This synchronous device replaces the output diode with a high efficiency P-channel MOSFET, increasing efficiency, maximum output current (up to 10A) and eliminating the heat sink typically required in medium to high power applications, making the LT8710 highly versatile for a wide range of power supply designs. Linear Technology Corp. introduces the LTC3875, a dual output current-mode synchronous step-down DC/DC controller that enables the use of very low DC resistance (DCR) power inductors by using a novel DCR sensing architecture that enhances the signal-to-noise ratio of the current sense signal. Power inductor DCR, as low as 0.2 milliohms can be used without a sense resistor to maximize converter efficiency and increase power density. This new DCR sensing technique dramatically reduces the switching jitter normally associated with low DCR sensing applications. Linear Technology Corp. introduces the LTC2874, an IO-Link master IC, combining a power and communications interface to four remote IO-Link devices (slaves). A rugged interface and rich feature set make the LTC2874 ideal for larger systems implementing IO-Link (IEC61131-9) in harsh, industrial environments. Managing four slaves per master IC, the LTC2874 reduces board space, design complexity and costs while increasing reliability. The LT3905 from Linear Technology is a fixed frequency, current-mode step-up DC/DC converter designed to bias avalanche photodiodes (APD) in optical receivers. The LT3905 features high side APD current monitoring with over five decades of dynamic range and better than 2% relative accuracy over the 3µA to 3mA range. The maximum APD current is programmed with a single resistor and a fast current limiter with indicator protects the APD during overload conditions. Linear Technology Corp. introduces the LT4321, an ideal diode bridge controller that replaces two diode bridge rectifiers with low-loss N-channel MOSFET bridges to increase the available power and reduce heat dissipation in a Power over Ethernet Powered Device (PoE PD). IEEE 802.3 PoE specifications require PDs to accept DC supply voltages of any polarity over their Ethernet inputs. Linear Technology Corp. announces the LT8614, a 4 A, 42 V input capable synchronous step-down switching regulator. A unique Silent Switcher™ architecture reduces EMI/EMC emissions by more than 20 dB, well below the CISPR 25 Class 5 limit. Even with switching frequencies in excess of 2 MHz, synchronous rectification delivers efficiency as high as 96% while Burst Mode® operation keeps quiescent current under 2.5 µA in no-load standby conditions. Linear Technology Corp. introduces the LTC2338-18, an 18-bit 1 Msps no latency analog-to-digital converter (ADC) with a wide ±10.24 V fully differential, true bipolar input range for high voltage, industrial applications. The device operates from a single 5V supply, achieves 100 dB SNR and -110 dB THD and features an internal 2.048 V (20 ppm/°C max) reference and reference buffer. An input divider network scales and level shifts the input signal, eliminating complicated circuitry required to directly interface true bipolar signals. Linear Technology Corp. announces the LT3090, the newest member of its LDO+™ family, a 600 mA low dropout negative linear regulator featuring low noise, rail-to-rail operation, precision programmable current limit and a bidirectional output current monitor. The device is cable-drop compensation capable, easily parallelable for higher current or PCB heat spreading and configurable as a floating 3-terminal regulator. Linear Technology Corp. announces the LT8697, a 2.5 A, 42 V input capable synchronous step-down switching regulator designed to power 5 V USB applications. The LT8697 delivers precise 5 V regulation at a remote USB port using programmable cable drop compensation to accurately correct the voltage drop from a long connecting cable regardless of variations in load current. The LT8697’s forced continuous operation enables the LT8697 to sink current, maintaining full frequency operation at zero load, further enhancing accurate 5V regulation during load transients. Linear Technology announces the LT3795, a 110V, high-side current sense DC/DC converter designed to regulate a current or voltage to a constant value, ideal for driving high brightness (HB) LEDs. Its 4.5V to 110V input voltage range makes it appropriate for a wide variety of applications, including automotive, industrial and architectural lighting. The LT3795 uses an external low side N-channel MOSFET and can drive up to 90V of white LEDs from a nominal 12V input, delivering in excess of 50 watts. Linear Technology Corp.'s LTC3607 is a high efficiency, 2.25 MHz synchronous dual output buck regulator that incorporates a peak current mode architecture. It can deliver up to 600 mA of continuous output current from each channel at output voltages as low as 0.6V from a 3 mm x 3 mm QFN or a thermally enhanced MSOP-16 package. The LTC3607 accommodates an input voltage range of 4.5 V to 15 V, making it suitable for dual cell Li-Ion applications as well as 5 V and 12 V intermediate bus systems. Linear Technology announces the LTC3330, a complete regulating energy harvesting solution that delivers up to 50mA of continuous output current to extend battery life when harvestable energy is available. The LTC3330 requires no supply current from the battery when providing regulated power to the load from harvested energy and only 750nA operating when powered from the battery under no-load conditions. MicroGen Systems announced that vibration energy harvesting BOLT™ Power Cells enabled a live wireless sensor network (WSN) using Linear’s Dust Networks LTC5800-IPM SmartMesh™ IP mote-on-chip at the Sensors Expo and Conference exhibition in Rosemont, IL on June 5-6, 2013. The LT3955, a DC/DC converter designed to operate as a constant-current source and constant-voltage regulator with an internal 3.5A switch, is now available from Linear Technology. The device’s internal PWM dimming generator makes it ideal for driving high current LEDs, and it also has features suitable for charging batteries and supercapacitors. Linear Technology Corp. introduces the LTC6957, a DC to 300 MHz dual output buffer/driver/logic translator, ideal for converting sine waves into low phase noise logic level signals. Prior solutions were unable to perform this conversion without introducing a significant amount of jitter. Linear Technology announces the LTC6995, a simple, accurate low frequency clock uniquely configurable for long duration power-on reset and watchdog timer applications. The LTC6995 is the latest part in the TimerBlox® family of versatile silicon timing devices, which combines an accurate programmable oscillator with precision circuitry and logic. Linear Technology Corp. introduces the LTC2314-14, a 14 bit 4.5 Msps successive approximation register (SAR) ADC in a tiny 8-lead TSOT-23 package, offering up to 90% reduction in size over competing solutions for space-conscious applications. This small SAR ADC integrates a precision 2.048 V/4.096 V reference with 7 ppm/°C typical and guaranteed 20 ppm/°C maximum temperature coefficient into an 8 mm² footprint. Linear Technology announces the LTC6090, a precision operational amplifier that operates on a supply voltage up to 140 V (or ±70 V). Its combination of rail-to-rail output, 3 pA (typical) input bias current, 1.6 mV maximum input offset voltage and 3.5 µVP-P low frequency noise delivers the precision required for high performance ATE, piezo driver, and DAC buffer applications. Linear Technology announces the LTC6430-15, a 15dB amplifier, which achieves high dynamic range in a 100 Ohm differential environment from 20 MHz to 1GHz and beyond. Two performance grades are available: at 240MHz, the A-grade OIP3 is typically 50 dBm and is fully tested and guaranteed to be a minimum of 47dBm. Noise Figure is 3dB, which corresponds to an input-referred amplifier noise of 1nV/√Hz. Linear Technology Corp. introduces the LTC4417, a triple-supply prioritized PowerPath™ controller for 2.5 to 36 V systems. The controller selects the highest priority valid supply among three inputs to power the load. Priority is defined by pin assignment, while a supply is considered valid after it has been inside a voltage window set by 1.5 percent accurate undervoltage and overvoltage thresholds for 256ms. Linear Technology Corp. introduces the LTC2945, a wide range I²C system monitor that monitors the current, voltage and power of any 0 to 80 V rail. In many cases, prior power monitoring solutions are limited to 3 to 5 V supplies and monitor voltages less than 36 V, requiring additional circuitry to monitor higher voltages. The LTC2945 has flexible power supply options, deriving power from a 4 to 80 V monitored supply, a 2.7 to 80 V secondary supply, or from the onboard shunt regulator. Linear Technology Corp. introduces three low power 16-bit, 20Msps analog-to-digital converters (ADCs), the LTC2269, LTC2270 and LTC2271, offering the lowest input-referred noise and tight integral nonlinearity error (INL) for very high precision DC measurements. With only 46µVRMS input noise and maximum guaranteed INL error of ±2.3LSB, these ADCs are suitable for very low noise, high linearity sampling applications such as digital x-ray, infrared and medical imaging, pachymeters, spectrometry and cytometry. Linear Technology’s Dust Networks® product group introduces the SmartMesh™ LTC5800 (system-on-chip) and LTP5900 (module) families, the industry’s lowest power IEEE 802.15.4E compliant wireless sensor networking products. SmartMesh ICs and modules enable tiny sensor “motes” to be designed with a battery life of over 10 years, while companion network manager components enable the development of highly robust and secure wireless sensor networks (WSN). Linear Technology announces the LTC6431-15, a 15.5 dB gain block that achieves high dynamic range in a 50 Ohm environment from 20 MHz to 1 GHz and beyond. It is manufactured on an advanced SiGe process and is available in two performance grades. Linear Technology Corp., a leading supplier of high performance analog integrated circuits, announced that its products are playing a key role in the Mars rover launched by NASA’s Jet Propulsion Laboratory (JPL). Linear Technology’s high performance analog semiconductors are used in the Mars Science Laboratory (Curiosity) rover to enable collection of vast amounts of data, including detailed visual images of the Martian landscape and precise readings to assist scientists in assessing the geology and history of Mars. Linear Technology announces the LTC6417, a fully differential buffer amplifier with only 1.5nV/√Hz output-referred noise. The LTC6417 is capable of driving a differential 50 Ohm load and is optimized for driving 14- and 16-bit pipeline ADCs. It can be DC- or AC-coupled at its inputs, and achieves excellent distortion performance for signals up to and beyond 600 MHz. At 140 MHz, OIP3 is 46 dBm, and HD3 is -69 dBc with 2.4 VP-P output swing into a 50Ohm load. Linear Technology Corp. announces the LT3959, a highly versatile DC/DC converter for boost, SEPIC and inverting power supply applications. Linear Technology Corp. introduces the LTC4364, a surge stopper with ideal diode, providing compact and low-loss protection for 4V to 80V electronics in automotive, avionics and industrial systems. The surge stopper shields downstream electronics from input overvoltages and overcurrent, enabling continuous operation through transient surges. Overcurrent limiting protects the system and supply from short-circuits at the load. Linear Technology announces the LTC5585, an ultra-wide bandwidth direct conversion I/Q demodulator with improved linearity performance (IIP3 = 25.7 dBm and IIP2 = 60 dBm at 1.95 GHz). <B>Linear Technology</B>, a California-based maker of linear integrated circuits, announced that it has opened a new 20,000-square-foot design facility in Manchester, NH. Linear said that it had outgrown its prior New Hampshire design center. Linear Technology introduces over 53 µModule® (micromodule) power products with SnPb BGA packages, targeting applications where the use of tin-lead soldering is preferred. µModule power products with SnPb BGA packages are offered in four DC/DC converter categories: (1) step-down or buck converters with single and multiple outputs, (2) buck-boost converters, (3) isolated converters, and (4) converters with PMBus digital telemetry with READ and WRITE data capability. Linear Technology Corp. introduces the LTC7813, a dual output (boost + buck), low quiescent current synchronous DC/DC controller. The LTC7813 operates from an input voltage of 4.5 to 60 V during start-up and maintains operation down to a 2.2 V input after start-up. The boost converter can produce an output voltage up to 60 V and the buck converter produces an output voltage ranging from 0.8 to 60V with the entire system achieving an efficiency as high as 98%. Linear Technology Corp. introduces the LTC2873, an RS485/RS232 multiprotocol transceiver in a small 20 mm² package. The LTC2873 integrates all the functions necessary to provide the most compact multiprotocol IC available today. Supporting ±26 kV HBM ESD bus protection, the LTC2873 provides a robust software-selectable interface for 3 to 5.5 V systems. Linear Technology Corp. introduces the LTC2380-24, a breakthrough no latency 24-bit 2 Msps successive approximation register (SAR) analog-to-digital converter (ADC). The LTC2380-24 features an integrated digital filter that averages 1 to 65,536 conversion results real time, dramatically improving the dynamic range from 101 dB at 1.5 Msps to 145 dB at an output data rate of 30.5 sps. Linear Technology Corp. announces the LT8331, a current mode step-up DC/DC converter with an internal 500 mA, 140 V switch. It operates from an input voltage range of 4.5 to 100 V, making it suitable for use with a wide range of input sources found in industrial, transportation and avionic applications. The LT8331 can be configured as either a boost, SEPIC, flyback or inverting converter. Its switching frequency is programmable from 100 to 500. Linear Technology Corp. introduces the LTC4282, an energy monitoring hot swap controller with dual MOSFET drive to enable 100 A and higher current board designs. The LTC4282 ensures safe board insertion and removal from live 2.9 to 33 V backplanes by controlling external N-channel MOSFETs to gently power up capacitors, avoiding sparks, connector damage and system glitches. High current hot-pluggable boards utilize parallel MOSFETs to reduce voltage drop. Linear Technology Corp. announces the LT3095, a dual-channel IC delivering two very low noise, low ripple bias supplies from a single input. Each channel incorporates a monolithic step-up DC/DC converter post-regulated by an integrated ultralow noise and high PSRR linear regulator. The LT3095 delivers up to 50 mA of continuous output current at output voltages up to 20 V with total ripple and noise < 100 µVP-P. The device operates from a 3 to 20 V input voltage range. Linear Technology Corp. announces the LT8631, a 1 A, 100 V input capable synchronous step-down switching regulator. Synchronous rectification delivers efficiency as high as 90% while Burst Mode® operation keeps quiescent current under 7 µA in no-load standby conditions. Its 3 to 100 V input voltage range makes it ideal for 48 V automotive systems, dual battery transportation, industrial and 36 to 72 V telecom applications. Linear Technology Corp. announces the LTC3265, a high voltage, highly integrated, low noise dual output power supply which takes a single positive input supply (VIN_P) and generates low noise bipolar rails up to ±2•VIN_P without any inductors. The device includes a boost doubling charge pump, an inverting charge pump and two low dropout (LDO) regulators. The boost charge pump has a wide 4.5 to 16 V input range. Linear Technology Corp. announces the LTC3121, a 3 MHz current mode, synchronous boost DC/DC converter with integrated output disconnect. Its internal 1.5 A switches deliver output voltages as high as 15 V from an input voltage range of 1.8 V at start-up (0.5 V when running) to 5.5 V, making it ideal for battery or standard 3.3 V and 5 V power sources. The LTC3121 delivers up to 40 0mA of continuous output current at 1 2 V from a 5 V input. Linear Technology Corp. introduces the LTC3877, a dual output multiphase synchronous step-down DC/DC controller with 6-bit voltage identification (VID) control that enables 10 mV output voltage step resolution, a necessary feature when powering FPGAs and ASICs with tight input voltage requirements. The LTC3877 operates over an input voltage range of 4.5 to 38 V and produces a fixed output voltage from 0.6 to 1.23 V when using VID and up to 5 V without VID. Linear Technology Corp. announces the LTC3887-1, a dual output synchronous step-down DC/DC controller with I²C-based PMBus interface for digital power system management. The LTC3887-1 differs from the previously released LTC3887 by providing a three-state PWM signal, enabling the use of DrMOS, power blocks or similar power stages. The enhanced feature set includes a 70 ms power-up time and a fast ADC mode that provides an 8 ms update rate for one parameter. Linear Technology Corp. announces the LTC3886, a 60 V input dual output synchronous step-down DC/DC controller with programmable loop compensation and I²C-based PMBus interface. This controller employs a constant-frequency, current-mode architecture with programmable output voltage up to 13.8 V. The LTC3886 is ideal for harsh environments requiring a high input voltage range commonly found in factory automation, industrial, medical, communications and more. Linear Technology announces the LTC5549, a double-balanced mixer that can operate either as an upconverter or downconverter, with a very wide RF frequency range from 2 to 14 GHz. The LTC5549 offers exceptionally high linearity of 24.4 dBm IIP3 at 9 GHz. The LTC5549 enables efficient microwave transmitter and receiver designs with an integrated LO buffer that needs only a 0 dBm drive level, effectively eliminating an external high power LO amplifier circuit. Linear Technology Corp. introduces an IO-Link (IEC 61131-9) reference design kit, which includes the DC2228A 8-port IO-Link master and DC2227A IO-Link device reference designs. The DC2228A is a complete 8-port IO-Link master reference design that uses two LTC2874 quad master ICs to implement its IO-Link v1.1 physical interface (PHY). The DC2227A is a complete IO-Link device reference design that uses an LT3669-2 device transceiver IC for communication. Linear Technology Corp. introduces the LTM4630-1, a dual 18 A or single 36 A µModule® (micromodule) regulator with high precision output voltage regulation for 28 nm and sub-28 nm FPGAs, ASICs and microprocessors.The LTM4630-1 provides precision output voltage regulation for both conditions: (a) ±0.8% maximum total DC error over line, load and temperature (-40°C to 125°C) and (b) ±3% total error, including transients, with minimum output capacitance. Linear Technology announces the LTC6268-10 single and dual LTC6269-10 4 GHz FET-input op amps for high dynamic range and high speed transimpedance amplifier (TIA) applications. The LTC6268-10 data sheet features example circuits ranging from 20 kΩ transimpedance gain at 210 MHz bandwidth, to 402 kΩ transimpedance gain at 34 MHz bandwidth. The LTC6268-10 is available in a 6-lead SOT-23 package, as well as an 8-lead SOIC with guard pins to protect against board leakage currents. Linear Technology announces the LTC6268-10 single and dual LTC6269-10 4GHz FET-input op amps for high dynamic range and high speed transimpedance amplifier (TIA) applications.With 0.45pF input capacitance and 1000 V/µs slew rate, the LTC6268-10 and LTC6269-10 are well suited for photodiode and photomultiplier (PMT) circuits, high impedance sensor applications and for driving analog-to-digital converters (ADCs). Linear Technology Corp. announces the LT8616, a 42 V input capable, high efficiency dual synchronous monolithic step-down switching regulator. Its dual channel design delivers independent 2.5 A and 1.5 A continuous current to outputs as low as 0.8 V. A dual channel synchronous rectification topology delivers up to 95% efficiency while Burst Mode® operation keeps quiescent current under 6.5 µA (both channels enabled) in no-load standby conditions. Linear Technology Corp. announces the LTC3892, a high voltage dual output synchronous step-down DC/DC controller that draws only 29 µA when one output is active and 34 µA when both outputs are enabled. The 4.5 to 60 V input supply range is designed to protect against high voltage transients, ensuring continuous operation during automotive cold crank and to accommodate a broad range of input sources and battery chemistries. Linear Technology introduces the LT6023, a dual 3 to 30 V low power operational amplifier, featuring 30 µV maximum input offset voltage and 60 µs settling to .01%. Proprietary slew enhancement circuitry results in a fast, clean output step response with low power consumption. Specially designed input circuitry maintains high impedance, which minimizes current spikes associated with fast steps for input steps up to 5 V.
Linear Technology Corp. announces the LTC3371, a highly integrated general-purpose power management solution for systems requiring multiple low voltage power supplies. The device features four synchronous buck converters, each powered from independent 2.25 to 5.5 V inputs, and each configurable to share up to four of eight available 1 A power stages. Linear Technology Corp. announces the LT8640, a 5 A, 42 V input capable synchronous step-down switching regulator. A unique Silent Switcher™ architecture, combined with spread spectrum frequency modulation, reduces EMI/EMC emissions by more than 25 dB even with switching frequencies in excess of 2 MHz, enabling it to easily pass the automotive CISPR25, Class 5 peak limits. Linear Technology Corp. introduces the LTM4623 3A µModule (micromodule) step-down regulator in an ultrathin 1.8 mm profile LGA package with only a 6.25 mm x 6.25 mm footprint.The LTM4623 operates from 4 to 20 V input supplies and precisely regulates an output voltage from 0.6 to 5.5 V with 1.5% maximum total DC output voltage error. Linear Technology announces the LT3790, a synchronous buck-boost DC/DC controller that delivers up to 250 W of power with a single IC. Its 4.7 to 60 V input voltage range makes it ideal for a wide variety of automotive and industrial applications. Its output voltage can be set from 0 to 60 V, making it well suited as a voltage regulator or battery/supercapacitor charger. Linear Technology Corp. announces the LT3668, a 400 mA, 40 V step-down switching regulator with dual tracking LDO outputs packaged in an MSOP-16E. The LT3668 operates from a VIN range of 4.3 to 40 V with transient protection to 60 V, making it ideal for automotive and industrial applications. Its internal 600 mA switch can deliver up to 400 mA. Linear Technology Corp. introduces the LTC4079, a 60 V, constant-current/constant-voltage 250 mA multi-chemistry battery charger. The device’s low quiescent current linear topology offers a simple inductorless design and accepts a wide 2.7 to 60 V input voltage range. The charge current is adjustable from 10 to 250 mA with an external resistor. Linear Technology Corp. announces the LTC2000, a 16-bit 2.5 Gsps digital-to-analog converter (DAC) with exceptional spectral purity of 74 dBc SFDR at 200 MHz output, and better than 68 dBc SFDR for output frequencies from DC to 1 GHz, a 12 dB improvement over alternative 14-bit DACs. The LTC2000 features low phase noise and a wide 2.1 GHz to 3 dB output bandwidth. Linear Technology Corp. introduces the LTM4634, a triple output step-down µModule® (micromodule) regulator in a 15 mm x 15 mm x 5.01 mm BGA package with integrated heat sink. The thermally efficient package enables the LTM4634 to deliver full current on all three outputs (5A, 5A, and 4A), more than 70 W of output power at 65° C ambient with 200 LFM airflow. Linear Technology Corp. introduces the LTC3807, a low quiescent current synchronous step-down DC/DC controller that draws only 50 µA in standby mode with the output voltage in regulation. The LTC3807 has powerful 1.1 Ohm on-chip MOSFET gate drivers. It operates with a selectable fixed frequency between 50 and 900 kHz and is synchronizable to an external clock ranging from 75 to 850 kHz. Linear Technology announces the LTC6091 and LTC6090-5, additions to the LTC6090 family of precision operational amplifiers which operate on a supply voltage up to 140 V (±70 V). The dual LTC6091 features separate output disable pins, making it useful in high voltage multiplexed applications. The decompensated single LTC6090-5 amplifier offers higher speed and is stable at a gain of 5 or above. Linear Technology Corp. introduces the LTM8046, a 2.5 W output DC/DC µModule® (micromodule) converter with 2 kVAC galvanic isolation (production tested to 3 kVDC) in a 9 mm x 15 mm x 4.92 mm ball grid array (BGA) package. A minimum creepage distance of 4.3 mm on the package exterior supports operation at a working voltage up to 400 VRMS in a pollution degree 2 environment. The LTC3622 is a high efficiency, 17 V input capable synchronous buck regulator from Linear Technology that delivers dual 1 A continuous current to outputs as low as 0.6 V. Synchronous rectification delivers efficiencies as high as 95%, while Burst Mode® operation requires only 5 µA of no load quiescent current. Linear Technology Corp. introduces the LTC2668-16, a 16-channel, 16-bit voltage output digital-to-analog converter (DAC) with SoftSpan™ outputs, each of which can be independently configured for one of five selectable unipolar and bipolar output ranges up to ±10 V. Each rail-to-rail DAC output is capable of sourcing or sinking 10 mA with guaranteed load regulation and is stable driving capacitive loads as large as 1000 pF. Linear Technology Corp. announces the LTC2107, a 16-bit 210 Msps high performance high-speed analog-to-digital converter (ADC) for high-end communications receivers and instrumentation applications. The LTC2107 has superior AC performance specifications, achieving 80 dB SNR performance, 4 dB higher than alternative products, and industry leading 98 dB SFDR at baseband. Linear Technology Corp. announces the LT3667, a 400 mA, 40 V step-down switching regulator with dual LDO outputs packaged in a 3 mm x 5 mm QFN or MSOP-16E. The LT3667 offers a highly compact, triple output solution for automotive and industrial applications. The LT3667 operates from a VIN range of 4.3 to 40 V with transient protection to 60 V.
Linear Technology introduces the LT6020, a dual 3V to 30V fast settling operational amplifier, featuring 30µV maximum input offset voltage and 0.5µV/°C max VOS drift. While supply current is only 100µA maximum per amplifier, proprietary slew enhancement circuitry provides fast clean output step response. The LT6020 settles to 0.0015% in less than 15µs regardless of whether the output step is 5V or 25V. Specially designed input circuitry maintains high impedance, minimizing current spikes associated with fast steps for input steps up to 5V. Linear Technology announces the LTC3637, a 76 V input-capable high efficiency buck converter that delivers up to 1 A of continuous output current. It operates from an input voltage range of 4 to 76 V, making it ideal for telecom, industrial, avionic and automotive applications. The LTC3637 utilizes a programmable peak current-mode design to optimize efficiency over a broad range of output currents. Linear Technology Corp. introduces the LTC3870, a dual phase synchronous step-down slave controller that can generate currents up to 240 A when paired with a companion master controller by extending the phase count in multiphase applications. Compatible master controllers include the LTC3880 and LTC3883 digital power system management controllers. Linear Technology Corporation announces the LT3048, a step-up DC/DC converter with an integrated LDO output that delivers a low noise, low ripple 15 V bias supply. The LT3048-15 delivers up to 40 mA of continuous output current at 15 V with output ripple and noise less than 500 µVPK-PK and 0.1 % load regulation. The device operates from an input voltage range of 2.7 to 4.8 V, making it suitable for single-cell Li-Ion batteries or 3.3 V logic rails. Linear Technology announces the LTC3107, a highly integrated DC/DC converter designed to extend the life of a primary battery in low power wireless system networks (WSNs). The LTC3107 combines energy harvesting and power management capability with a primary battery cell to extend the battery’s usable lifetime. The LTC3107 harvests energy from thermoelectric generators (TEGs) and thermopiles when these sources are available. Linear Technology Corp. announces the LT3840, a wide range synchronous step-down DC/DC controller which includes a 7.5 V buck-boost bias voltage to provide efficient gate drive over a 2.5 to 60 V input voltage range. The LT3840 generates a 7.5 V bias voltage for MOSFET gate drive regardless of whether the input voltage is above, below or equal to 7.5 V.
Linear Technology Corp. announces the LTC3784, a high power two phase single output synchronous step-up DC/DC controller that replaces rectifying boost diodes with high efficiency N-channel MOSFETs. This device can produce a 24 V output at 10 A from a 12 V input at up to 97% efficiency without any heat sink. The LTC3784 operates from an input voltage ranging from 4.5 V to 60 V during start-up. Linear Technology Corporation introduces the LTC3128, a high efficiency, input current-limited buck-boost super capacitor charger with active charge balancing for 1 or 2 series super capacitors. The LTC3128 features an average input current limit that can be programmed up to 3A with +/-2% accuracy, preventing power source overload while minimizing capacitor recharge time. Linear Technology announces the LTC3638, a 140 V input-capable high efficiency buck converter that delivers up to 250 mA of continuous output current. It operates from an input voltage range of 4 to 140 V, making it ideal for telecom, industrial, avionic and automotive applications. The LTC3638 utilizes internal synchronous rectification and a programmable hysteretic-mode design to optimize efficiency over a broad range of output currents. Linear Technology announces the LTC5577, a 300MHz to 6GHz active down converting mixer with outstanding +30 dBm IIP3 (Input Third Order Intercept) and 0 dB conversion gain. The LTC5577 has wide operating frequency capability, covering all cellular bands from 450 MHz to 3.6 GHz with a single part. It’s IF output port, usable from1 MHz to 1.5 GHz, delivers flat conversion gain performance to over 600 MHz bandwidth. Linear Technology announces new high reliability H grade and military MP grade versions of the LTC3612, a high efficiency, 4 MHz synchronous buck regulator that incorporates a constant frequency, current mode architecture. The device can deliver up to 3 A of continuous output current at output voltages as low as 0.6 V from a 3 mm x 4 mm QFN or a thermally enhanced TSSOP-20 package. Linear Technology Corporation announces the LT3065,a high voltage, low noise, low dropout voltage linear regulator offering precision, programmable current limit and a power good flag. The device delivers up to 500 mA output current with a 300 mV dropout voltage at full load. It features a wide 1.8 to 45 V input voltage range and output voltage is adjustable from 0.6 to 40 V.
Linear Technology Corporation introduces the LTC3874, a dual phase synchronous step-down slave controller that generates currents up to 300 A when paired with a companion master controller by extending the phase count in multiphase applications. Compatible master controllers include the LTC3866, LTC3875 and LTC3774, which all have true current-mode control. Linear Technology announces the LTM4644 quad output step-down µModule® (micromodule) regulator configurable as a single (16A), dual (12A, 4A or 8A, 8A), triple (8A, 4A, 4A) or quad (4A each) output regulator. This flexibility enables system designers to rely on one simple and compact µModule regulator for the variety of voltage and load current requirements of FPGAs, ASICs and microprocessors. Linear Technology Corp. announces the LT3086, the latest addition to the LDO+™ family, offering significant functionality previously unavailable in linear regulators. The 40 V, 2.1 A low dropout linear regulator (LDO) includes current monitoring with externally settable current limit and temperature monitoring with external control of thermal limit temperature. Linear Technology Corp. announces the LT8610A and LT8610AB. Both are 3.5 A, 42 V input capable synchronous step-down switching regulators. Synchronous rectification delivers efficiency as high as 96% while Burst Mode® operation keeps quiescent current under 2.5 µA in no-load standby conditions. Their 3.4 to 42 V input voltage range makes them ideal for automotive and industrial applications. Linear Technology has launched the LTM4633, a triple output 10A step-down µModule® (micromodule) regulator in a 15 x 15 x 5.01 mm BGA package with integrated heat sink for enhanced heat dissipation. Combined with bypass capacitors and three resistors, the LTM4633 solution fits within 4.5 cm² on a dual-sided PCB. Linear Technology Corp.'s LTC3774 is a current-mode dual output synchronous step-down DC/DC controller that enables the use of very low DC resistance (DCR) power inductors by enhancing the current-sense signal. Power inductor DCRs down to 0.2 milliohms can be utilized to maximize converter efficiency (up to 95%), increase power density and reduce the output ripple voltage in high current applications. Linear Technology Corporation introduces the LTC4120, a first for the company in the wireless battery charging space. The LTC4120 combines a wireless power receiver with a constant-current/constant-voltage battery charger, functioning as the receive circuit component in a complete wireless power transfer system comprised of transmit circuitry, transmit coil, receive coil and receive circuitry. Linear Technology Corp. announces the LTC3255, a versatile high voltage step-down switched capacitor converter that delivers up to 50 mA of output current. In applications where the input voltage exceeds twice the output voltage, a charge pump offers nearly twice the efficiency of an equivalent linear regulator, and provides a space-saving inductor-free alternative to switching DC/DC regulators. Linear Technology Corp. announces the LTM4676, a dual 13A or single 26A µModule® (micromodule) step-down DC/DC regulator with a serial digital interface. The interface enables system designers and remote operators to command and supervise a system’s power condition and consumption. The LTM4676 simplifies system characterization, optimization and data mining during prototyping, deployment and field operation. Linear Technology Corp., introduces the LTM4630, a dual 18 A per output or single 36 A output DC/DC µModule® step-down regulator capable of delivering up to 144 A when four devices are current shared. The LTM4630 is a complete DC/DC regulator system in a 16 mm x 16 mm x 4.41 mm LGA package, which includes inductors, MOSFETs, DC/DC controller and compensation circuitry. Linear Technology announces the high temperature H-grade version of the LTC3122 in a 12-lead thermally enhanced MSOP package. The LTC3122 is a 3 MHz current-mode, synchronous boost DC/DC converter with integrated output disconnect. Its internal 2.5 A switches deliver output voltages as high as 15 V from an input voltage range of 1.8 V at start-up (0.5 V when running) to 5.5 V.
Linear Technology Corp. announces a new H grade, wider temperature range version of the LT1965 a 1A LDO with high power density. The IC features low dropout voltage of only 300 mV at full load, wide VIN capability of 1.8 to 20 V and an adjustable output from 1.2 to 19.5 V.
Linear Technology Corp. announces a new high reliability MP-grade, wider temperature range version of the LTC3245, a versatile 250 mA high voltage buck-boost charge pump. The MP grade has an operating junction temperature range of -55° C to +150° C. The LTC3245 MP grade is available in a compact 12-lead MSOP package with a backside thermal pad. Linear Technology launches the LTM4624, a 14 V, 4A step-down µModule® (micromodule) regulator in a 6.25 x 6.25 x 5.01 mm BGA package which, including a few passive components, fits within 1 cm² on a single-sided PCB or 0.5 cm² double-sided. Like other µModule regulators, the LTM4624 includes the DC/DC controller, power switches, inductor and compensation in a single package. Linear Technology introduces the LT6015 single Over-the-Top® operational amplifier with outstanding precision over a 0 to 76 V input common-mode voltage range. It incorporates multiple built-in fault tolerant features, resulting in no-compromise performance over wide operating supply and temperature ranges. Linear Technology Corp. introduces the LTM2892, a 6-channel SPI/digital or I²C µModule® (micromodule) isolator for 3.3 to 5 V systems. Ground potentials can vary widely in systems, potentially exceeding common mode operating limits, which can interrupt communications, destroy components, and even create hazardous conditions. Linear Technology announces the LTC5510, a high performance mixer with very wide frequency range, extending to 6 GHz. It provides a continuous 50 ohm matched input from 30 MHz to 6 GHz, while delivering outstanding linearity and gain flatness. These features enable applications to work over a wider frequency span without needing to rematch the input for different frequency bands, thereby reducing cost and simplifying design. Linear Technology Corp. announces the LTM4649, a 10A step-down µModule® regulator with high operating efficiency and low temperature rise in a 9 mm x 15 mm x 4.92 mm BGA (ball grid array) package. The LTM4649 requires no heat sink, airflow or output current derating at full power from 0° to 83° C ambient temperature. Linear Technology Corp. announces the LT3081, a rugged 1.5 A wide input voltage range linear regulator with key usability, monitoring and protection features. The device has an extended safe operating area (SOA) compared to existing regulators, making it ideal for high input-to-output voltage and high output current applications where older regulators limit the output. Linear Technology announces the high temperature H-grade (-40° C to 150° C junction temperature) and high reliability MP-grade (-55° C to 150° C) version of the LTC3115-1 in a 20-lead thermally enhanced TSSOP package. The LTC3115-1 is a synchronous buck-boost converter that delivers up to 2 A of continuous output current from a wide range of power sources from single-cell Li-Ion to 24/28 V industrial rails to 40 V automotive inputs. Linear Technology Corp. introduces the LT4320, an ideal diode bridge controller for 9 to 72 V systems that replaces each of the four diodes in a full-wave bridge rectifier with a low loss N-channel MOSFET to significantly reduce the power dissipation and increase available voltage. The controller operates from DC to 600Hz. Linear Technology Corporation announces the LT3995, a 3A, 60V step-down switching regulator, requiring only 2.7 µA of quiescent current. The LT3995’s 4.3 to 60 V input voltage range makes it ideal for automotive, commercial vehicle, avionic and industrial applications. Its internal 4.7 A switch can deliver up to 3 A of continuous output current to voltages as low as 1.2 V.
Linear Technology Corp. announces the LT3055, a high voltage, low noise, low dropout voltage linear regulator offering precision, programmable current limit and diagnostic capability. The device delivers up to 500 mA output current with a 350 mV dropout voltage at full load. The LT3055 features a wide 2 to 45 V input voltage range, delivering adjustable output voltages from 0.6 to 40 V.
The LTC3621 is a high efficiency, 17V input capable synchronous buck regulator from Linear Technology that delivers up to 1A of continuous output current to outputs as low as 0.6 V. Synchronous rectification delivers efficiencies as high as 95% while Burst Mode® operation requires only 3.5 µA of no load quiescent current. Linear Technology Corp. announces the H-grade version of the LTC3722-1, a phase-modulated full bridge DC/DC controller with adaptive or manual zero voltage switching (ZVS). The device’s ZVS delay control and adjustable synchronous rectification timing optimize efficiency while reducing transformer size and electromagnetic interference, making it well suited for isolated high power applications of up to several kilowatts. Linear Technology Corp. announces the LT3007, the latest member in a family of high voltage, micro power, robust PNP-based LDOs, featuring an ultralow 3µA quiescent current. The LT3007’s high input voltage capability, spanning 2.0 to 45 V with an adjustable output voltage ranging from 0.6 to 44.5 V, enables operation in a wide variety of application spaces. Linear Technology announces the LTC3129, a synchronous buck-boost converter that delivers up to 200 mA of continuous output current from a wide variety of input sources including single or multiple-cell batteries as well as solar panels and supercaps. Its 2.42 to 15 V input range and 1.4 to 15.75 V output range provide a regulated output with inputs above, below or equal to the output. Linear Technology Corp. announces the LT3030,a dual low noise, low dropout regulator with independent inputs and independent shutdown control for each channel. The device delivers continuous output current up to 750 mA on one channel and 250 mA on the other channel, with a low dropout voltage of only 300 mV at full load. Linear Technology Corp. introduces the LTM8001, a step-down µModule® (micromodule) regulator consisting of an array of five low noise 1A linear regulators. The linear regulators are also configurable to deliver 2A, 3A, 4A or 5A, depending on the number and combination of current shared outputs. Linear Technology introduces the LT6016 and LT6017, dual and quad wide input range operational amplifiers. These amplifiers combine high precision with the ruggedness and versatility of LTC’s unique Over-the-Top® architecture. 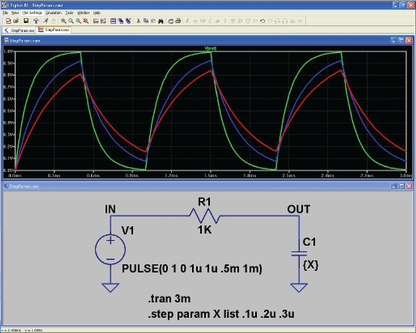 Input offset voltage is 50 µV max, input bias current is 5 nA, and low frequency noise is 0.5 µVP-P. Linear Technology Corp. announces the LT8705, a very high efficiency (up to 98%) synchronous buck-boost DC/DC controller that operates from input voltages above, below or equal to the regulated output voltage. This device has four feedback loops to regulate the input current/voltage, along with the output current/voltage.The LT8705 can be used in a wide range of applications such as a voltage stabilizer in telecom and automotive requirements. Linear Technology Corporation introduces the LTM8045, a 2.8 to 18 V input, multi-topology DC/DC µModule® (micromodule) converter, with onboard inductor, power switch and DC/DC controller delivering up to 700 mA output current. The LTM8045 is designed for point-of-load regulation in communications, imaging and handheld test equipment. Linear Technology announces the LTC3646, a 40 V input capable synchronous buck converter than can deliver up to 1 A of continuous output current from a 3 mm x 4 mm DFN-14 (or thermally enhanced MSOP16) package. It operates from an input voltage range of 4 to 40 V, making it ideal for automotive and industrial applications that require high voltage input capability. Linear Technology announces the LT3761, a 60 V DC/DC controller designed to operate as a constant-current source and constant-voltage regulator. Its internal PWM dimming generator makes it ideal for driving high current LEDs, but it also has features making it suitable for charging batteries and super-capacitors. Linear Technology Corp. announces the LTC3375, a highly-integrated general-purpose power management solution for systems requiring multiple low voltage power supplies. The device features eight independent 1A channels with I²C control, flexible sequencing and fault monitoring in a compact QFN package. Linear Technology Corp. introduces the LTC3864, a high voltage step-down DC/DC controller that draws only 40 µA quiescent current in standby mode with the output enabled in Burst Mode® operation. The 3.5 to 60 V input supply range is designed to protect against high voltage transients, to operate continuously during automotive cold crank and covers a broad range of input sources and battery chemistries. Linear Technology Corporation introduces the LTC4226, a dual Hot Swap™ controller, enabling safe board insertion into live 4.5 to 44 V backplanes. The LTC4226 controls external N-channel MOSFETs to gently power up the board, avoiding sparks, connector damage and system glitches. A dual rate fault timer protects the MOSFET and system from long or damaging overcurrents. Linear Technology announces the LT3763, a synchronous buck LED driver controller that delivers over 300 W of LED power. Its 6 to 60 V input voltage range makes it ideal for a wide variety of applications, including automotive, industrial and architectural lighting. Similarly, its output voltage can be set from 0 to 55 V, enabling it to drive a wide range of LEDs in a single string. Linear Technology Corp. announces the LTC3122, a 3 MHz current-mode, synchronous boost DC/DC converter with integrated output disconnect. Its internal 2.5A switches deliver output voltages as high as 15 V from an input voltage range of 1.8 V at start-up (0.5 V when running) to 5.5 V, making it ideal for battery or standard 3.3 V and 5 V power sources. Linear Technology Corp. introduces the LTM4641, a 4.5 to 38 V input, 0.6 to 6 V output, 10A step-down µModule® regulator with comprehensive electrical and thermal protection for loads such as processors, ASICs and high-end FPGAs. The LTM4641 µModule regulator monitors input voltage, output voltage and temperature conditions. Linear Technology Corporation introduces the LTM4620, a dual 13A per output or single 26A output DC/DC µModule® (pronounced micromodule) step-down regulator that delivers up to 100A when four devices are current shared. The LTM4620 is a complete DC/DC regulator system in a 15 mm x 15 mm x 4.41 mm LGA package, including inductors, power stages and all control circuits. Linear Technology announces the H-grade version of the LT3518. The LT3518 is a 45 V, high-side current sense DC/DC converter designed to drive high current LEDs at constant current. Its 3 to 30 V input voltage range with transient protection to 40 V makes the LT3518 ideal for a wide variety of applications, including automotive, industrial and architectural lighting. Linear Technology Corporation introduces the LTC2996 high accuracy temperature sensor for 2.25 to 5.5 V systems. The LTC2996 measures a remote diode’s temperature with ±1° C accuracy and its own die temperature with ±2° C accuracy while rejecting errors due to noise and series resistance. Linear Technology Corporation introduces the LTC4000-1, a high voltage controller and power manager with input maximum power point control (MPPC) that converts virtually any externally compensated DC/DC power supply into a full-featured battery charger. The LTC4000-1 is capable of driving typical DC/DC converter topologies, including buck, boost, buck-boost, SEPIC, flyback and forward. Linear Technology announces the LTC5584, an ultrawide bandwidth direct conversion I/Q demodulator with outstanding linearity of 31 dBm IIP3 and 70 dBm IIP2. The device offers best-in-class demodulation bandwidth of over 530 MHz, supporting the latest generation of LTE multimode, LTE Advanced receivers, as well as digital predistortion (DPD) receivers. Linear Technology introduces the LTM9012, a quad 14-bit, 125 Msps µModule® analog-to-digital converter (ADC) with integrated fixed gain drivers, passive filtering and bypass capacitance. The integrated µModule converters offer dramatic reduction in board space for high channel-count applications as diverse as medical imaging systems and MIMO 4 G base stations. Linear Technology has developed the LTC6946, the first device in a family of high performance integer-N frequency synthesizers with integrated VCO, delivering −226 dBc/Hz normalized closed-loop in-band phase noise, −274 dBc/Hz normalized in-band 1/f noise and best-in-class −103 dBc spurious output.